OmniTrust™ medical gloves are made to strict quality standards in modern, state-of-the-art manufacturing facilities. 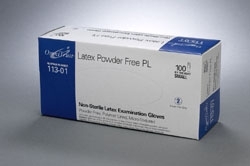 Our non-sterile, ambidextrous latex exam glove line features our premiere reduced protein powder free glove. Omni International research and development has created a glove with all the best qualities our customers require into ONE lightly textured powder free glove. All of our products are bar coded using UCC standards to enhance supply chain efficiencies for our customers. 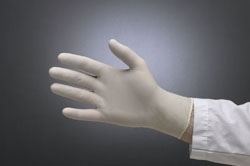 Reduced protein, latex examination glove with less than 50μg of protein per gram. Our Premiere Latex glove is micro-textured for added grip control without loss of tactile sensitivity. This glove is manufactured with a non-chlorination process thus maintaining the stretch characteristics of latex in its non-chlorinated state. A unique polymer lining gives this glove excellent donning characteristics. Flat packed for optimum dispensing. Available in sizes Small through Extra Large.